Battery saving is built in to Android, you need to go into your device's power saving menu and make sure Poweramp is listed as an exception to its processes. Since the last update of the Poweramp, it crashes. Poweramp has all the permissions and I do not use any task killers or anything kind of that. And still, after 4-5 minutes of playback, music stops. Poweramp says, that the process was killed by the system. Also, I did tried to change the setting of Poweramp-wakelock, notification, but still the same. The only one way to use it today is to switch the brightness to the minimal level and switch the option Always keep the screen turned on in Poweramp. Nothing custom other than 128gb micro sd that my music lives on. - This message is shown after it is re-launched for a SECOND time. ---- Ex: What? no music! Unlock phone. Poweramp says it was killed, and has re-launched automatically but is not playing. Click close button (see mmhmmm.killed.jpg). 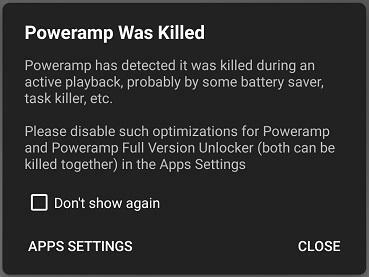 Poweramp IMMEDIATELY closes/crashes AGAIN, and GIVES SAME KILLED EXCUSE. There must be some other power-saving option in your device that is closing PA when it goes fully to sleep, perhaps you could check in the support forums for the device?